Everyone wants their career to be in high demand—because demand translates to great pay and no shortage of work. These days, the big data space is brimming with that kind of employment, as companies of all sizes need to collect and analyze information in order to make decisions and predictions (and get results). 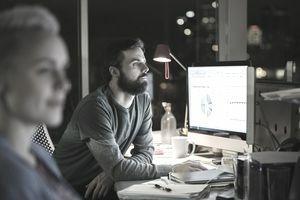 That’s precisely what data scientists do: discover information, make connections, create data visualizations, and help companies operate efficiently. And a thorough understanding of the right programming languages is essential for interpreting statistics and working with databases. According to KDnuggets, 91% of data scientists use the following four languages. R is a statistics-oriented language popular among data miners. It is an open-source, object-oriented implementation of S, and is not overly difficult to learn. If you want to learn how to develop statistical software, R is a good language to know. It also allows you to manipulate and graphically display data. As part of their Data Science Specialization program, Coursera offers a class on R that not only teaches you how to program in the language but also goes over how to apply it in the context of data science/analysis. Like R, SAS is used primarily for statistical analysis. It’s a powerful tool for transforming the data from databases and spreadsheets into readable formats (like HTML and PDF documents) as well as the more visual tables and graphs. Originally developed by academic researchers, it has become one of the most popular analytics tools worldwide for companies and organizations of all kinds. It’s more of a large corporation type of software and is not typically used by smaller companies or individuals working on their own. Resources for learning SAS are listed in this document. The language is not open-source, so you likely will not be able to teach yourself for free. Although R and SAS are most commonly thought of as “the big two” in the analytics world, Python has recently become a contender as well. One of its main perks is its wide variety of libraries (e.g. Pandas, NumPy, SciPi, etc.) and statistical functions. Another factor to consider is that Python is perhaps the easiest to learn, due to its simplicity and the wide availability of courses and resources on it. The LearnPython website is a great place to start. You can also find a fuller list of Python learning materials. So far we’ve been looking at languages that are in the same family and (more or less) have the same functions. SQL, which stands for “Structured Query Language,” is where that changes. This language has nothing to do with statistics; it focuses on handling information in relational databases. It is the most widely used database language and is open source, so aspiring data scientists definitely shouldn’t skip it. Learning SQL should equip you to create SQL databases, manage the data within them, and use relevant functions. Udemy offers a training course that covers all the basics and can be completed fairly quickly and painlessly. At a minimum, you should probably learn SQL and choose at least one of the statistics languages. But if you have the time (and in the case of SAS, money) and want to really up to your marketability, there’s nothing to say you can’t learn all four! Don’t rush it, get lots of practice, hone your skills—and enjoy the job security.